Nearly 45 years ago, a local advertising agency gave Virginia a priceless gift–an iconic advertising slogan. In 1969, the Virginia State Travel Service placed an advertisement in the July issue of Modern Bride magazine featuring a slogan that would later make advertising history: Virginia is for Lovers. Officials at the state’s travel service wanted young adults to be the next generation of Virginia tourists, and Lovers seemed like the perfect theme to entice them. 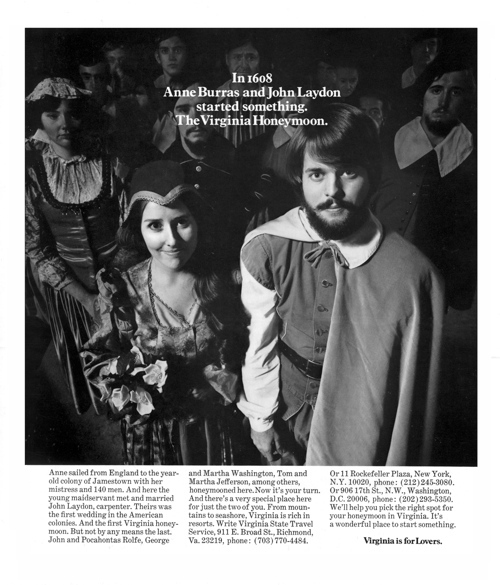 The first “Virginia is for Lovers” advertisement in Modern Bride, June 1969. The reason? Love really was all around in the late 1960s. Erich Segal’s Love Story was a #1 New York Times Bestseller, Jacqueline Susann’s novel The Love Machine was a reader favorite, and Woodstock drew over 300,000 young Boomers to celebrate peace, love, and music. It was a copywriter named Robin McLaughlin of Martin & Woltz Inc.–the Richmond advertising company that would later become The Martin Agency–who coined the famed slogan. Originally, the iconic phrase included modifiers: “Virginia is for beach lovers” would, for example, accompany an advertisement for Virginia Beach; an ad showcasing the Shenandoah Mountains would read “Virginia is for mountain lovers,” etc. But the agency felt the general “Virginia is for Lovers” was more evocative. They removed the modifiers, and premiered the simplified version in Modern Bride nearly 45 years ago. On the legacy the slogan has had on the agency, he said only a few individual ad campaigns have made people take serious notice of the agency, ads that helped propel the company’s prestige in the advertising world.2 “The first of those propelling [ads] was the ‘Virginia is for Lovers’ campaign,” Smith said. Diane Béchamps, the Vice President of Marketing at the Virginia Tourism Corporation (VTC),3 said, “People just think it’s a fun and cool way of reminding people that vacationing is about the emotional bond” that’s forged. “Love is at the heart of every Virginia vacation,” she said. In 2009, “Virginia is for Lovers” was inducted into the Madison Avenue Advertising Walk of Fame, joining other famed advertising initiatives like the Budweiser Clydesdales and the “Like a good neighbor, State Farm is there” slogan. Also in that year, Forbes named the phrase one of the top-ten tourism marketing campaigns. Even as the slogan approaches a half-century of life, it’s celebrity status still makes it an invaluable commodity to Virginia tourism, one that the VTC has no interest in retiring.